Dr. Abdoulaye Nikiema, Global Heath Security Program Manager and a Biosafety-Biosecurity specialist at the African Society for Laboratory Medicine (ASLM), recently attended a strategic planning workshop organized by the International Federation of Biosafety Associations (IFBA) in collaboration with the Biorisk Management Association of Kenya (BMAK) and Biosafety and Biosecurity Association, Uganda (BBA-U). 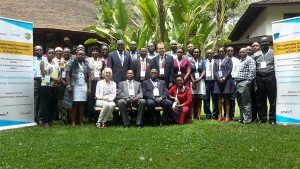 The workshop took place 11-12 January 2018 at the Safari Park Hotel in Nairobi, Republic of Kenya, as part of the IFBA/BMAK/BBA-U partnership project funded by Global Affairs Canada. The workshop was preceded by a training session on non-governmental organization management for the board members of BMAK and BBA-U on 10 January 2018. The focus of the strategic planning workshop was on strengthening sustainable biosafety and biosecurity in East Africa. Its overarching goal was to set out a strategic plan for BMAK and BBA-U in coordination with the existing initiatives, stakeholders, and partners who are actively engaged in biosafety and biosecurity activities across East-Africa. The workshop agenda included an overview of BMAK and BBA-U, a presentation on the strategic planning process and group work to develop the BMAK and BBA-U strategic plans. ASLM was invited to participate in the strategic planning workshop session as a pan-African organization to provide guidance and input for the development of BMAK and BBA-U’s strategic plans and activities. This was to ensure a coordinated effort and partnership amongst key stakeholders in the East African region and Africa as a whole. The meeting also featured the participation of the Africa Centres for Disease Control and Prevention (CDC) and other partners based in Kenya and Uganda. The members of BMAK and BBA-U, with the support of the other participants, were able to create their initial strategic goals, objectives and activities. These were developed based on SWOT analyses (an examination of strengths, weaknesses, opportunities and threats), PESTEL analyses (an examination of macro-environmental factors, namely political, economic, social, technological, environmental, and legal) and stakeholders’ analyses. The participants raised the need for collaboration and partnership in the area of biorisk management. ASLM took the opportunity to present its ongoing initiative of developing a Biosafety & Biosecurity Resources Center (BSS-RC) for laboratory and biorisk management stakeholders. BMAK and BBA-U agreed to participate in the development of the ASLM BSS-RC. The meeting was also an opportunity for the ASLM representative to discuss potential areas of collaboration with Ms. Maureen Ellis, IFBA Executive Director, and Mr. Michael Weaver, Program Coordinator at IFBA, and the roles ASLM could play to strengthen biosafety and biosecurity in Africa. ASLM and IFBA agreed to work together to build the BSS-RC as the “One Stop Shop” biosafety and biosecurity information in Africa. An important side event of the workshop was the official 2016 IFBA Biosafety Heroes Award ceremony. The IFBA Biosafety Heroes Award celebrates extraordinary individuals who make significant contributions to help others in the field of biosafety and biosecurity. The 2016 Award winner was Ms. Doris Bota from Kenya. In partnership with the United States CDC and the Kenyan Ministry of Health, Ms. Bota has facilitated the training of over 1000 health workers across Kenya, resulting in measurable improvements in biosafety in their laboratories. She also served in a technical working group that produced a variety of Kenyan biosafety and biosecurity guidelines and curricula. ASLM is pleased to have the privilege of serving as a partner for BMAK, BBA-U, and the other institutions in their future biorisk management activities. ASLM salutes IFBA, BMAK and BBA‑U for the successful organization of the event and were pleased to participate in the development of BMAK and BBA-U’s strategic plans.